I have fond memories of the meal I ate at 51 Lincoln two years ago. And as this summer rolled around and I began to get emails about their new rooftop garden and their BBQ specials, I realized it merited a return. Chef and Owner Jeffrey Fournier kindly offered my friend Ilene and I a chance to check out his July menu. Or more specifically, his July 13th menu as the dishes change daily. I am a huge fan of Bar Chef Ben Brenner's creations and was just as pleased tonight. 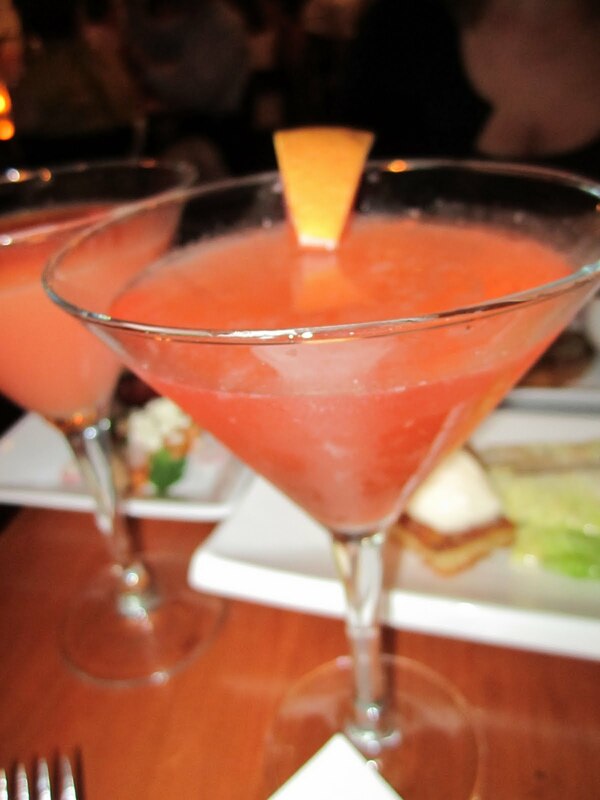 He somehow intuited my love of Aperol and mixed up it up with fresh grapefruit juice and Citadel gin. 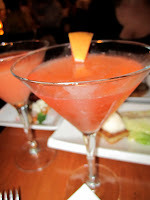 Ilene's Scarlet Martini was a bit sweeter but with a bite: Svedka Clementine, Luxardo Triplum, Blood Orange juice and lime. The bread are made in-house and reflect the playfulness and ambition of the restaurant. The basket included focaccia, corn bread, and a wonderful ciabbata with onion-like nigella seeds. We dipped into the homemade tomato-chili jam and hummus. For the month of July, 51 Lincoln is switching it up with BBQ. Each week they focus on another state and, best of all, is the price: 3 courses for $35. We enjoyed the foods of North Carolina, and thus, one of our first appetizers was a plateful of fried green pickled tomatoes. We then enjoyed a cup of soupy, smokey, tender BBQ shrimp. One of the cornerstone dishes of the restaurant is their pan-seared watermelon steak. Ironically, Ilene and I were ambivalent about the butter-braised fruit. But we couldn't get enough of its partner: chickpeas cooked with tomatoes and topped with thinly sliced radishes and French feta. I was shocked that my favorite dish of the night was a Caesar salad. I am not a huge fan of dressing and Caesar salad can be so pedestrian, gloppy, salty. Not here. Instead, what arrived were wide pieces of Romaine, topped with silky, tender white anchovies. This was heavenly eaten with a bite of the homemade crouton and the richness of Fiore di Nonna's Burrata. I will easily go back for this. The incredible Fiore Di Nonna cheese accompanied the next dish. A tempura fried shrimp sat next to homemade mozzarella. The cheese was brightened with an ancho chili rub and emerald dots of basil oil. Thai purple and green basil, picked from the restaurant's roof top garden, were wonderful with the soft cheese. But the best part of the dish? A fabulous champagne reduction that was the result of reducing the alcohol with star anise until it was both syrupy and just acidic enough. The BBQ meal continued with pulled pork sitting atop collard greens and accompanied by a mustard sauce and fresh cole slaw. The meat was flavorful and falling apart tender and was amped up with the mustard sauce. Our other main? Perfectly cooked Atlantic Salmon that was as sweet and succulent as I have had. In the center was one beautiful squash blossom filled with fresh ricotta and sitting on two saucers of fried yucca. We were treated to a trio of seasonal desserts. Fresh strawberries were piled on a tender biscuit and were topped with wonderful basil whipped cream. A Fig Newton Highlands played off of the traditional. Here were two Fresh mission figs, topped with ricotta and sitting boldly on butter cookies. My favorite element was the base: a puree of figs and late Harvest Riesling. My favorite dessert, though, was the pecan pie. Rarely have I had a pie that doesn't taste monotone of sticky sweetness. But here, fresh crunchy pecans were the focus, while the base tasted of caramel, rather than being overwhelmed by sugar. 51 Lincoln was bustling on a summer night. It is a great alternative for festive food without heading into Boston and fighting for parking. I will return for the bar menu. I am not sure it can get better than than housemade Charcuterie, a plate of Wasik's cheese and Brenner's cocktails. That being said, 51 Lincoln also offers lunch (and includes that Caesar salad!). There isn't a kid's menu, per se, but it does offer a chance to amp up a child's palate. For example, my three year old would be thrilled to eat up a grilled cheese made with Tellegio, a burger with aged cheddar or rigatoni with homemade bolognese. My pickier 5 year old, though, would be happy with pasta mixed with Parmesan and butter. You can also sample the 3 course BBQ meal here as well.